The following introduction was written by Salomon N. Meisels' daughter, Yala Korwin, a fine poet, a wonderful artist, and a frequent contributor to THT's pages. The two following poems, written in Hebrew by my father, Salomon Nachmani Meisels (1887-1942), were found by my surviving sister in Israeli archives. My father was a multifaceted man. He was an editor of a Hebrew literary magazine, Tnuatenu (Our Movement), a poet, writer, teacher, sage, and lover of music and song. 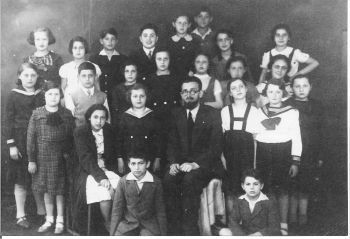 He was a high school teacher of Jewish religion and history, in Lwów, a city in southeastern pre-war Poland. 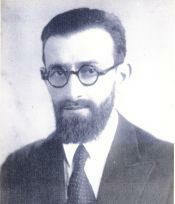 A self-taught polyglot, he spoke Hebrew, Yiddish, German, French, and Russian. He had several books published, mostly treatises on the Bible. I remember the title of one of them: Or Torah (Light of the Torah). Only two of his books survived in Israeli archives. Likewise, only two poems of his survived At father’s request I produced the drawing for one of the poems, “Cupful of Songs.” The rest of his output, together with his manuscripts, perished in the conflagration of WWII. He had a good singing voice, and taught himself to play the mandolin. We, my two sisters and I, loved our singing sessions with him. He taught us many songs: Polish, Hebrew, Yiddish, French, and Russian. I vividly remember my father and a visiting tenor from Palestine (Israel was not yet on the map) sitting together in our dining room, as father played his mandolin while translating an aria from Cavaleria Rusticana by Mascagni into Hebrew. Hitler’s executioners robbed my father of his life. May his memory be blessed. Salomon N. Meisels and students (above). Both pictures are circa 1930. The vignette illuminating "Cupful of Songs" (below) is a replica of one made by Yala Korwin at her father's request in 1935. To a child of dawn. Drink from a cupful of songs. Get up, poet, hold on to your loot. The sky will shine, all diamonds. From Tnuatenu (Our Movement), Nov./Dec. 1935. Translated from the Hebrew by Yala Korwin with the help of her Israeli sister Helene Fuksenbroner. For a brother who never was. At the king’s opulent table. Good wine and good song. Lavish is the king’s table. Servants, bring some more wine. And only one song for both. Rich is the king’s table. Wine is plentiful. Pour some more! A brother I wanted, did not come. From Tnuatenu (Our Movement), date unknown. Translated from the Hebrew by Yala Korwin with the help of her Israeli sister Helene Fuksenbroner.